It is becoming increasingly apparent that the crop circles that have appeared over southern England in recent years are not simply hoaxes, as some would have us believe. 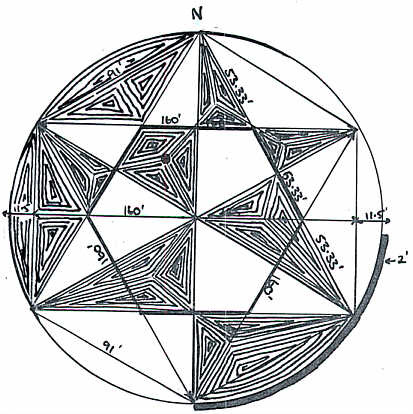 Every year brings new and more complex patterns and many of the crop circles are now expressive of profound geometric and mathematical truths. So much so that the possibility of at least some of these crop circles being hoaxed is now out of the question. They are not. Something else is at work here, something deep and mysterious and as a result we are pleased to be able to bring you a first hand field report from crop circle researcher Charles Mallet. 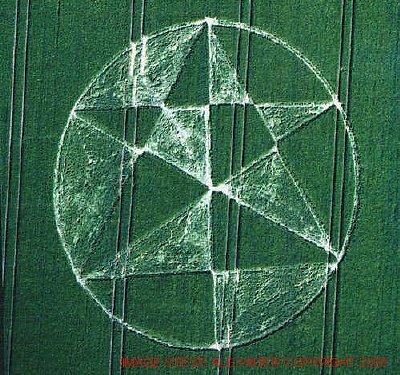 Living near Devizes in Wiltshire, Charles is very much at the centre of crop circle activity; in the course of his investigations he often sleeps in the fields at night and thus his reports are very much on site, first hand accounts. The diagram by his wife Frances reveal a multi-faceted depth and complexity that is way beyond the grasp of a few country yokels trying to create a hoax. In the first of what will become a series of occasional reports we present . . .Signs of the Times. After some reflection regarding the accompanying formation I feel a few points are worth mentioning, not least the fact that night of the formations arrival the weather was pretty grim. There was moderate to heavy rain from 8pm through most of the night, which left the field completely saturated. Can you imagine a team of people out in those conditions stomping in mud and barley all night? I can’t. One can only guess that the people who claim to have made this formation have not only perfected crop circle hoaxing but also seem to be able to levitate at will to avoid getting mud all over the floor of the glyph. Hmmm. In the past I have visited new formations at first light after it had been raining the previous night. Invariably one finds that by the time you’ve walked to the formation you are carrying several pounds of top soil on your boots, leaving obvious prints all over the place. How could four or five people leave no trace whatsoever after a night of such heavy rain? No doubt this formation will be claimed by at least one team of jokers and the sad thing is that most people who have not seen the evidence for themselves will believe them. But no jokers made this formation, of that I am quite sure. On the whole this is a fine quality crop circle with some very clever attributes, in fact this level of sophistication is what one would expect much later in the season. It was a shame that this formation was wrecked by the weather so quickly and comprehensively.